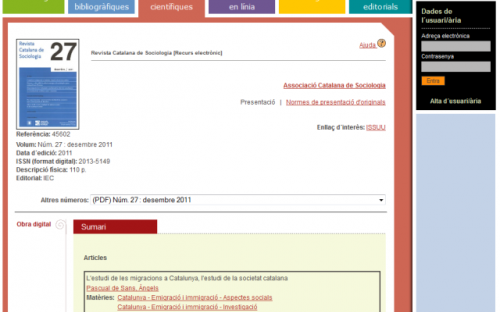 This project aims to find a technological solution that provides online access to the journal of the Catalan Association of Sociology (ACS) via the Internet, and allows workers of the association to update the contents easily. The users may not just view the contents of the electronic magazine but they may also add comments to articles or perform searches using the thesaurus. The editors, with no need of being computer savvies, will be able to use a computing tool in order to enter the articles’ information: chapter titles, authors of the article, authors of each chapter, classification by according to the thesaurus search engine, bibliography, abstract, an excerpt of the article and a PDF containing the entire article. 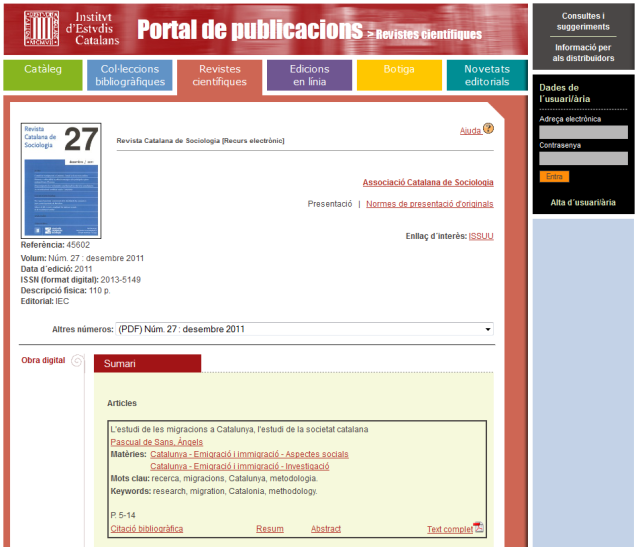 Once the project is complete, inLab is responsible for the hosting in the server of the Institute of Catalan Studies, applying the necessary security requirements. By switching from traditional to digital publications, the client gains in terms of efficiency, cost and availability of the journal. Our experience in Web applications ensures the tool is adapted to meet the needs of the ACS.